Post-detox – and I have a plan for keeping the weight off and making sure I carry on eating a nutrient-dense diet. The first and easiest thing is to continue having juices/smoothies for breakfast. I’ve always loved doing this but I’d slipped out of the routine. Firmly back into it now, though! 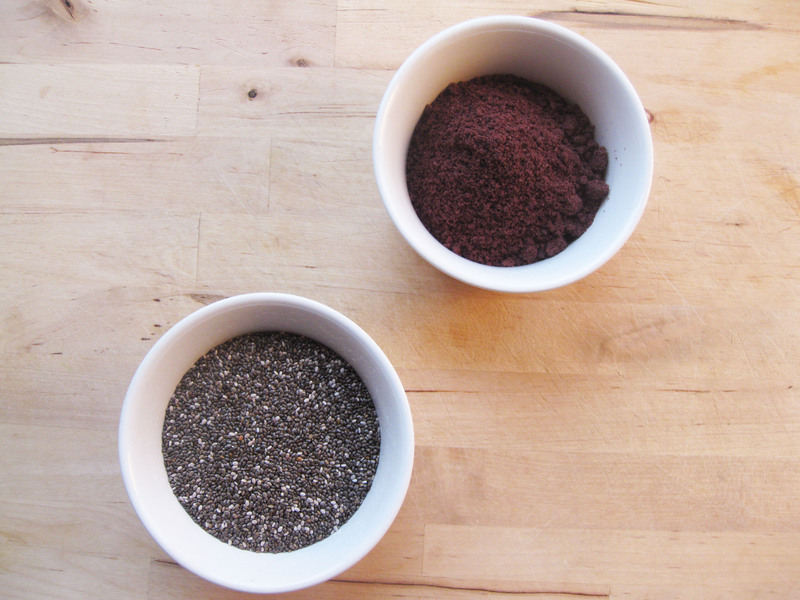 This recipe showcases two amazing ingredients – acai berry powder and chia seeds. 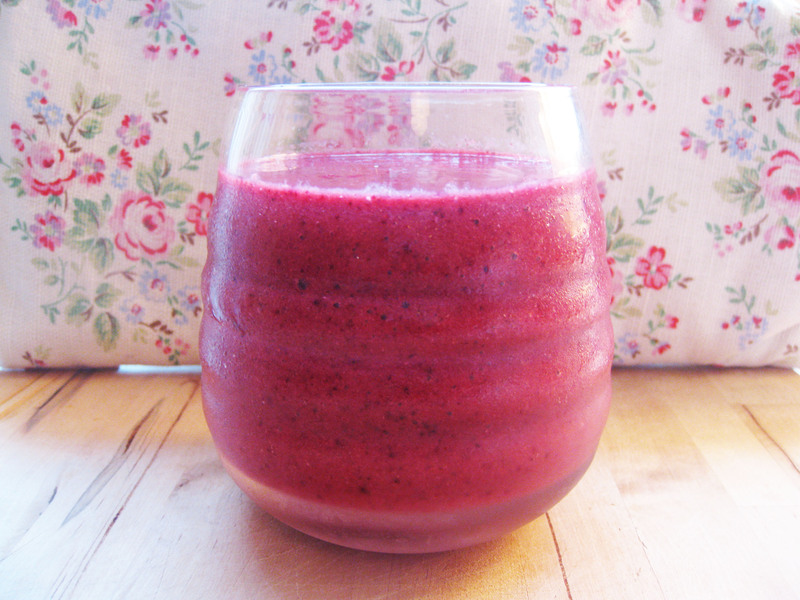 Someone gave me some acai berry powder the other day so I tried it out in this smoothie and it gave the smoothie a beautifully rich, complex taste – as well as incredible amounts of nutrients, including phytochemicals, antioxidants and omega-3 and -6. Buy some today – you won’t regret it. But how can I call this a smoothie, you’ll be wondering?… There’s no yogurt, banana or any of the other things you normally make a creamy smooth smoothie from. The answer is the tiny, nutrient-powerhouse that is the chia seed. Chia seeds are super-rich in vitamins and minerals, especially calcium, potassium and iron, they have the highest amount of omega-3 in any plant-based ingredient and also contain excellent quantities of fibre and protein. What’s more, when chia seeds are mixed with liquid, they expand and form a coating of gel. This means that they can act as a bulking ingredient – and this is why you can get a smoothie consistency when used with a juice mix, and why many people swear by chia seeds for weight-loss as they feel fuller for longer. But it also means that they can be used as a substitute for eggs in baking – more of that to come…. So go for it with chia seeds – sprinkle them onto salads or stir-frys, thicken soups and stews with them and try them in this awesome smoothie. 1. Put all the ingredients into a blender or food processor and process until smooth. Spring onions turned up in my veg box this week and it made me think of lighter, Asian-style food. I’ve been meaning to try this idea out for a while, but it’s felt too wintery recently. But as the blossom is now in full bloom on the trees and the weather has turned warmer, I thought it would be good to try this. Spring onions are often combined with ginger and sesame oil, and these marry wonderfully well with the subtle tastes of pak choi and white fish. 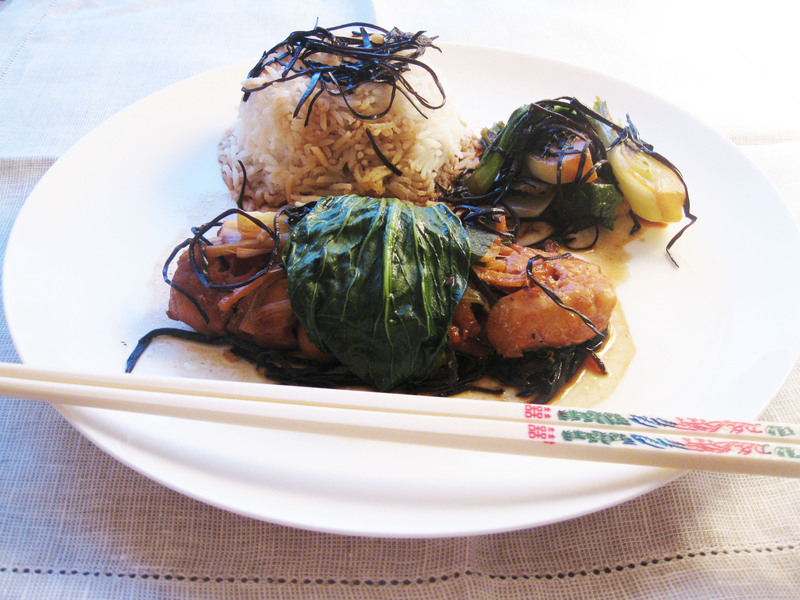 I’ve used pollack because the sauce makes the fish taste delicious, and I’ve added lots of the sea vegetable, arame, to maximise the healthy aspect of this dish. Arame, like all sea veg, contains high levels of iodine, which, as well as boosting your immune system, it helps to keep your metabolism working at an optimum level. I bought some Chinese rice wine for this dish – and it was a revelation! I’m not sure what I was expecting but, to me, it tastes rather like sherry. The recipe uses 5 tablespoons of the wine and the bottle says that the wine will only keep for a week. So there was no choice, really – we had to drink the rest. (Yep, the detox is over!) I had bought Doragon Sake – and we drank it warm as the bottle suggested, slowly over the course of a couple of days. It’s opened my eyes to a whole new world of wine! Remove the 2 outer leaves from each pak choi and immerse in a bowl of boiled water for about 1 minute until the leaves have softened. Refresh under cold running water and leave to one side. Cut the remaining pak choi into quarters. Arrange the spring onion strips and ginger on the top of the fish and wrap the softened pak choi leaves around the fish, tucking each end under the fish. Heat the sesame and olive oils in a large wok over a medium heat until hot. Pour in the rice wine, tamari and miso soup and add the arame, making sure the arame is immersed in the liquid. Bring to the boil, then place the fish on the top and cover with a lid. (If your wok is too small for all the fish, cook in batches.) Cook for 5 minutes, then add the remaining pak choi quarters and cook, covered, for a further 3–5 minutes until the fish is cooked through. Serve immediately with steamed rice or rice noodles. It’s totally true that the way to a man’s heart is through his stomach – well, certainly my husband’s. And if Peter’s reaction to this recipe is anything to go by, then THIS recipe is the way to his heart. I knew Peter would like this – he likes strong, robust flavours and loves red meat (a true Aussie bloke!) but, to be honest, I was surprised by quite how much he liked it. This wasn’t just awesome, it was apparently the best thing I’d ever cooked him. Wow! 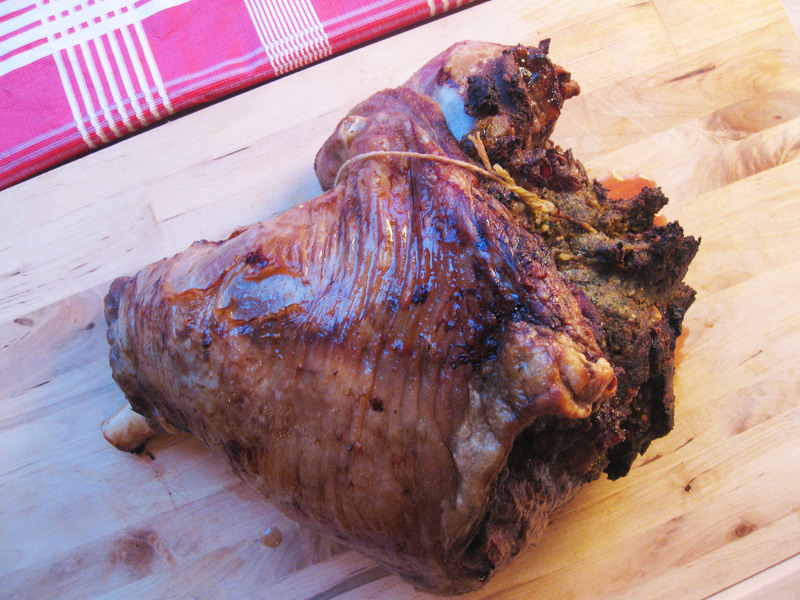 We eat lamb at Easter, like many people, but as the season for Welsh lamb starts in March and English lamb in April, I find it’s nice to focus on eating lamb in springtime, anyway. Red meat is sometimes viewed by people as an unhealthy choice. The BSE and Foot and Mouth crises seem to have turned people away from eating red meat, and the fear of high amounts of saturated fat in those meats seem to have kept them away. But if you buy good-quality meat (I always buy organic meat because I want to eat meat that has been humanely reared and doesn’t have residues of pesticides, chemicals or antibiotics), and either buy meat that is lean or remove the fat after cooking, then you are eating something that is incredibly good for you. Meat is truly full of goodness – and is crammed with protein, the building block for our bones, tissues and teeth – which keeps us strong and healthy. Lamb is also a great source of many vitamins, including vitamin B3 (which helps boost your memory) and vitamin B12 (which is key to the production of red blood cells and cell metabolism). 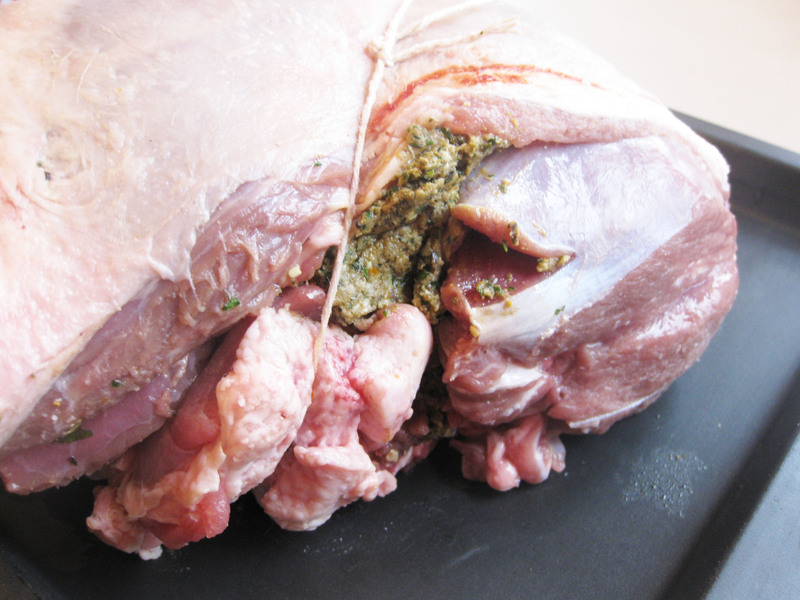 Lamb also contains selenium (great for your heart) and sulphur (good for your hair, nails and joints). This is an incredibly easy recipe to make. You just whizz the stuffing ingredients up, stuff the joint and into the oven. Serve with lots of veggies and I promise you’ll love every mouthful! 1 Preheat the oven to 250°C/500°F/gas 9. Put the bread in a food processor and blend until the mixture becomes fine breadcrumbs. Remove from the food processor and leave to one side. 2 Rinse the olives and drain them. 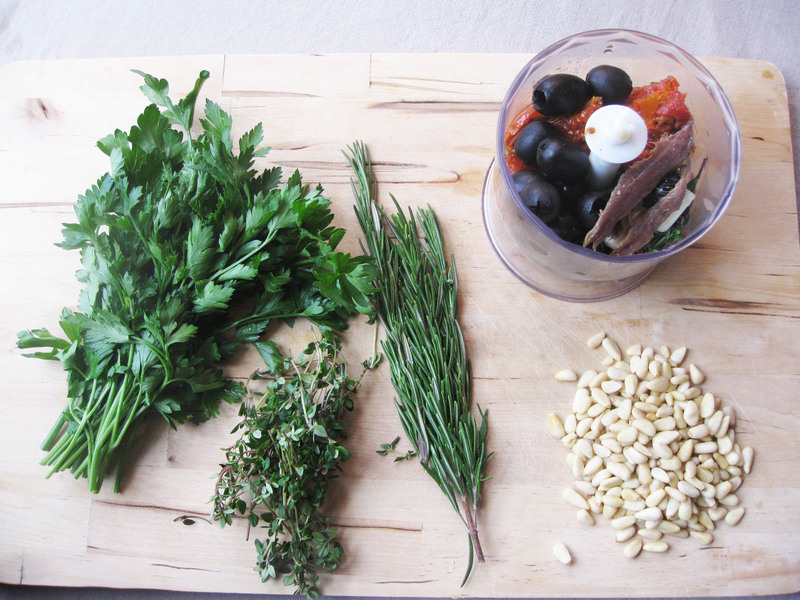 Put in a mini food processor and add the garlic, anchovies, sun-dried tomatoes, rosemary and thyme. Blend to form a finely chopped paste. Transfer to the food processor and add the parsley. Pulse until the parsley is finely chopped, then add the pine nuts and breadcrumbs and pulse until the pine nuts are chopped. 3 Spoon the stuffing mixture into the cavity of the lamb, pressing down well with the back of a spoon to pack the stuffing in, and secure by tying with string. (Next time I make this recipe, I’ll use more string and tie it up more!) Rub the olive oil over the lamb then transfer to a baking tray. 4 Bake for 15 minutes, then turn the oven down to 200°C/400°F/gas 6 and cook for a further 55 minutes – 1 hour 10 minutes, depending on how pink you like the meat. Remove from the oven and cover with baking parchment, ensuring the ends of the paper are tucked under the tin. Leave to stand for 10 minutes, then remove the baking parchment and serve. Recently I devised some recipes for Kallo, for their new range of organic soya milks (which are delicious!!) 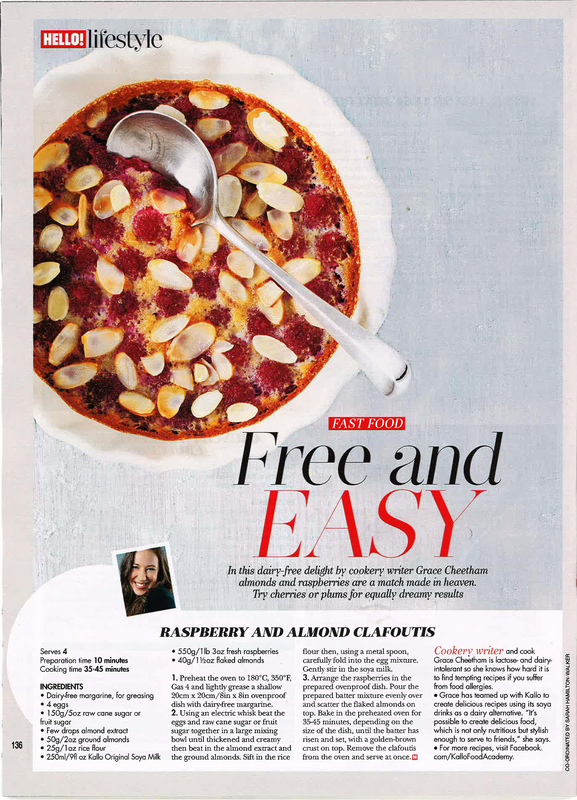 One of the recipes I created was a Raspberry and Almond Clafoutis. I adore clafoutis – it’s a a baked dessert in a custard-like batter, similar to pancake batter. Originally a French dish, it was traditionally made with cherries, but you can find many variations using summer/autumnal fruits such as plums and blueberries. It’s easy to make a good gluten-free and dairy-free batter, but it is important to use good soya milk. This recipe combines raspberries and almonds – a classic combination of tastes – with an extra kick of almond from the almond extract. Super-easy to prep and assemble – and thoroughly delicious! Preheat the oven to 180°C/350°F/Gas 4. Lightly grease a large (approximately 20 x 20cm) ovenproof dish with dairy-free margarine. Beat the eggs and sugar together in a mixing bowl with an electric whisk until thickened and creamy. Beat in the almond extract, then sift in the rice flour and add the ground almonds. With a metal spoon, carefully fold into the egg mixture. Gently stir in the soya milk. Put the raspberries on the bottom of the dish. Pour the batter over the top and scatter the flaked almonds over the top. Bake in the hot oven for 35–45 minutes, depending on the size of the dish, until risen and set, with a golden-brown crust formed on the top. Remove from the oven and serve. I made these with a little helper – Zoe. She was excellent at helping to mix and at putting all the cupcake cases into the bun tin. She kindly licked the spoons to make them clean and helpfully tasted each stage to make sure that it tasted good. Unfortunately, though, once they were made, I heard a crash in the kitchen while I was having a bath. Cries of “Mummy” came from the kitchen, followed by Peter coming to explain that Zoe had tipped the container over and the cupcakes were now squashed. Luckily I’d already taken the picture – and I guess we’ll just have to eat the squashed ones quickly and make some new ones now for Easter day! Preheat the oven to 180°C/350°F/gas 4 and arrange 10 cupcake cases in a bun tin. Using an electric mixer, beat the dairy-free margarine and sugar together in a large mixing bowl until light and fluffy. Gradually beat in the eggs, one at a time, until well mixed. 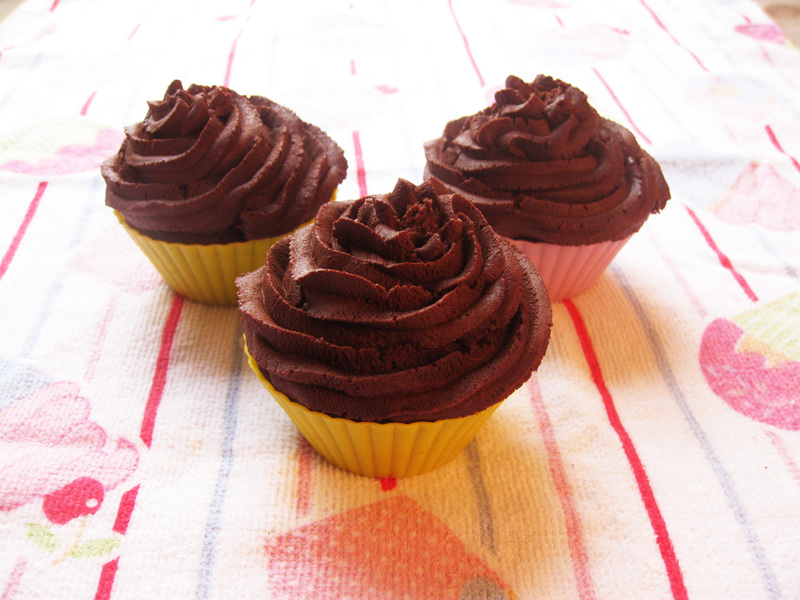 Sift the rice flour, buckwheat flour, gluten-free baking powder, xanthan gum and cocoa powder into the mixture. Quickly fold in the ground almonds, using a spoon and mix well, but take care not to overmix. Divide the mixture evenly into the cupcake cases. Bake for 15–18 minutes, until well risen and a skewer inserted in the centre comes out clean. When the cupcakes are cooked, remove from the oven and turn out of the tin, then transfer to a wire rack and leave to cool completely. Spread or pipe a little of the frosting over each cupcake and serve.